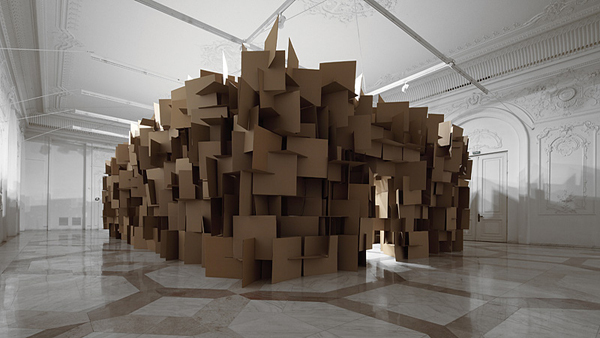 Swiss Sculptor Zimoun, in collaboration with architect Hannes Zweifel, has has designed and built a series of sound sculptures MNAC Contemporary Art Museum of Bucharest in Romania. 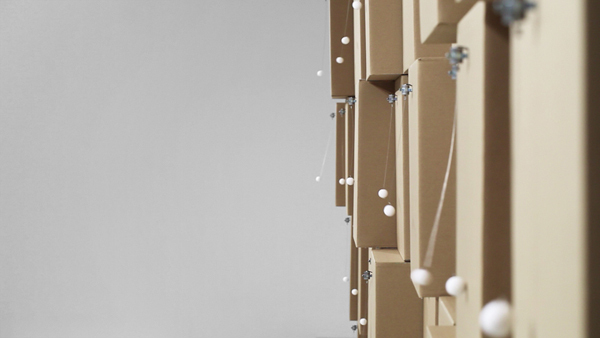 These architecturally-derived instruments of sound are made from common, everyday materials, such as cardboard, paper, string, and wire.These materials and mechanisms are combined to create intricate sound sculptures. 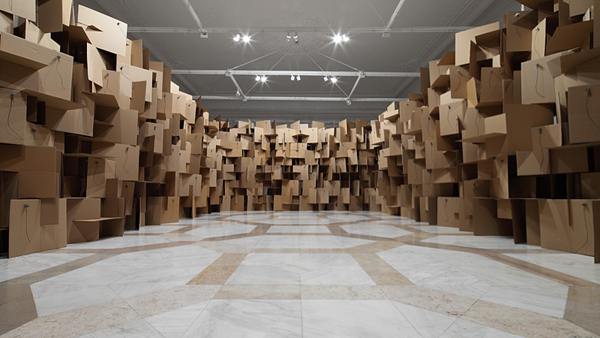 The surface of each sculpture can be a mix of intersecting planes, offset cubes, or hollowed out boxes. 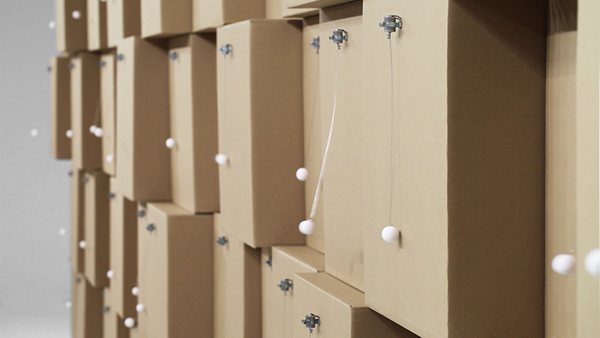 Embedded within these expansive, geometric surfaces and volumes are small mechanical devices, usually tiny motors, that activate and move different sorts of appendages, like plastic balls tethered to lengths of wire, or simple lengths of metal thread, that rotate and move, producing sound. 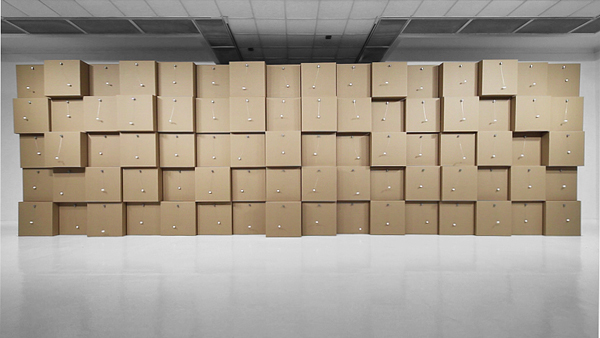 These repetitive, dissonant choruses, through their sheer quantity and arrangement across space, create the spatial qualities reminiscent of traditional forms of music, often evoking a rhythmic and constant tempo throughout their performance. This occurs in spite of the fact that the mechanisms are not timed with one another, or activated in any particular order. 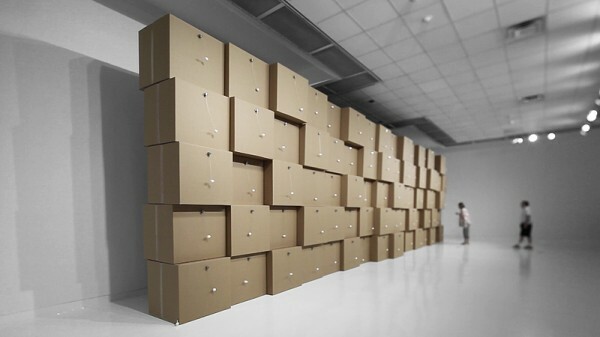 These modified, commonplace industrial objects, when taken en masse and mechanically activated according to Zimoun’s complex geometric forms, exemplify the architectural, manifestation of tonal qualities that both analyze and pay ode to natural phenomena of sound and movement. 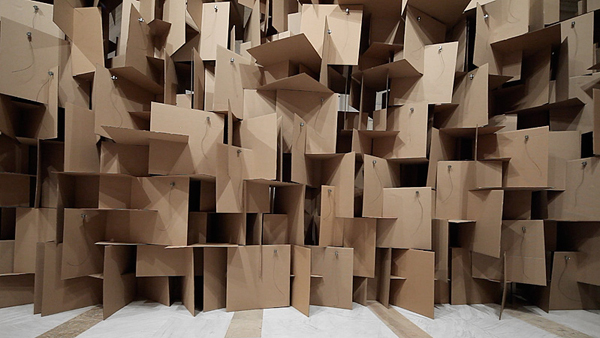 This project utilizes form and sound to engender the illusion of space.